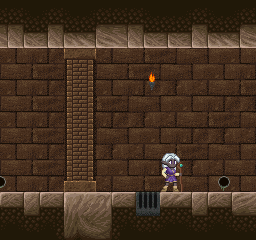 I've been working on a new area, which as the thread title suggested is an underground passage. I've got some good tiles for the base layout, I think. But I'd like to get some feedback before I got too far with it. I'm open to all criticism, so please be honest with your responses. 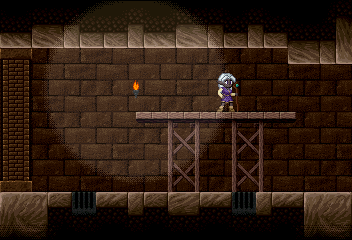 I'm going for roughly a SNES-style game. It looks serviceable, but uninspired. As a video game environment, it's pretty forgettable honestly. I feel like it should have something that makes it unique, interesting, and memorable. Another thing I just noticed. On the right side of the second picture, it would appear from the floor tiles at the bottom that this is an accessible area. However, the tiles above here look solid. In the first picture, I feel like you differentiate pretty well by assigning a particular brown to the background. The second picture breaks the rules that you visually taught the player about your game world. 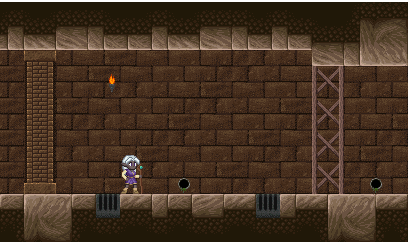 The middle and right side backgrounds aren't distinguishable as different game elements from the solid top and bottom tiles. -Still after that, i colour replaced one of the red/browns in the same background portion with a purple to make that colour colder, and the whole texture more dynamic. -Added shadows and highligts to the far background, mostly in relation to the solid foreground but also within and in relation to the pillar and the torch. -Added some regrettably sloppy highlights to anything "metal" - the grate and the pipe. You get the idea - shiny objects, higher contrast, sharper/bolder boundaries between levels of light. -embedded the sewage pipe on the right in a bit of circumfering purple to make it melt a bit better into the far background. 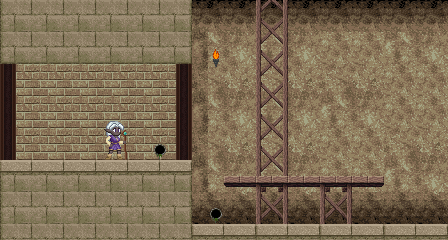 -Added gradiented attributes to the "deep" solid foreground, above and below. It is both hue shifted and darkened. What i'm still missing is some detailing that tells the player something about this place. Who built this tunnel? What for? What is their culture? How was it used? I might also want to even out the grainy-quality level detail between different textures so that they feel artisically more coherent. Some of them kind of come across as scaled photo-graphics unless worked with. I'd might even consider removing a colour or two out of the grainy detail. But you can go a long way just by balancing shadows and highlights. Last edited by FrankenGraphics on Sat Mar 02, 2019 3:13 pm, edited 4 times in total. I've been thinking I would apply a foreground layer for some shading/lighting effects, but I didn't include it in these pictures because it doesn't look right in its current form. I figure a layer effect would work better because one, it could darken the sprites too, because honestly it looks weird when the character is so much brighter than the world, and two, since I'm not going to have any paralax scrolling for the background, I have a second layer to work with anyway. It's good to see how much other people find this important too. I do love the results you have produced with all of this, but I'm a little apprehensive toward making too many of these changes. Granted, I'm not actually encoding all of this onto a SNES ROM, but I still want this to look like something accurate to the era. I've even been reducing everything to a 15-bit color depth. 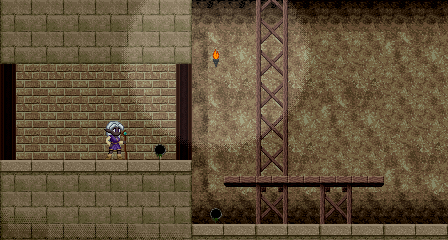 It doesn't really look like it, but that pillar uses the same palette as the wall behind it, and both of the wall sections in the second image are using the same palette as well. And all these changes you've made have noticeably increased the number of colors in the palette, and I think how many colors are used in 8x8 tiles too. They look great though, so I'm kinda staring at this and thinking: what changes are the most important? Which new colors are the most worth adding? Oh that looks great. This is the color-picking stuff I never manage to pull of right. Whenever I try something like that it looks like crap. I love it! I'm definitely going to use that! I see where you are going with this; I will try to work something like that in there. Oooh, I see it! Yeah, that's a great subtle effect! I've seen some SNES titles create this effect by changing the palette per scanline, so it doesn't actually increase the the palette the tiles are using. But I think what I'll do is incorporate that effect into the lighting layer I mentioned above, that will give me a little more control over how it looks. I'm hoping that would be more evident in the final game itself, but I will try to figure out what I can do to add to the "story" the environment tells. Good call. Could you do me a favor and point out exactly which tiles you think conflict artistically? I used some new tricks and methods for creating some of these tiles, and if this is something you are noticing I want to make sure that it isn't just these methods that are changing things. I'm not actually encoding all of this onto a SNES ROM, but I still want this to look like something accurate to the era. Okay, if that is what you want. But for an actual SNES it might look a bit too much like a SNES game. If you would want a more natural scene on SNES, then you might want to try to obscure the "tile/map appearance" as much as possible. 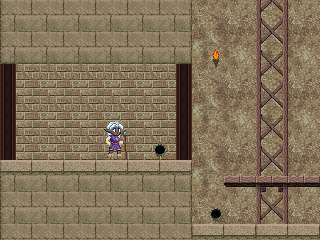 For example: Add some BG tiles with edges that are unaligned to the 8x8 or 16x16 tile boundaries. 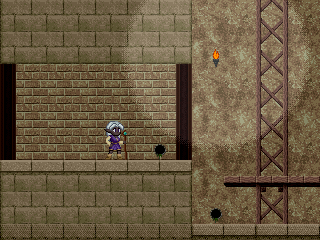 Insert some subtly dirty/wet/cracked/smaller/crumbled bricks, instead of repeating the same brick-pattern all over the place (the changes of the brick colors from FrankenGraphics did also make it look as if there were more/different tiles; that edits looked pretty cool). For outdoor scenes, uneven floor would be also looking nice. On the other hand, I have never created anything like that myself, and if I would try to, I might end up with straight tile/map appearance, too. And maybe I wouldn't even bother too much about it, especially if I wanted to make simple and minimalistic graphics. I am just being critical because you had asked for it. And, also because you have natural detail "inside" of the tiles, but it doesn't look so natural because one can easily see the "blocky" tile boundaries, ie. the user may look at it and say: Yes, all trees are exactly 16 pixels wide, and, surprise, the height of all steps & edges is an exact multiple of eight, and this or that is made of a single tile repeated all over the place, and everything is perfectly horizontal or vertical. Another thing: When you say SNES like - what is your intended screen resolution? In this thread, and other threads, you have used 240, 256, and 288 pixel heights, which looks as if the resolution changes on the fly, or as you haven't cared about that topic yet (or originally didn't do so). And all those heights would be a bit too much for a NTSC SNES, unless you are planning to use vertical scrolling to view the whole picture. But then, in a vertically scrolled picture, I was wondering if it would be possible too "see the floor" in all situations. Last edited by nocash on Sat Mar 02, 2019 6:20 pm, edited 2 times in total. This was reduced to 40 colours indexed mode, with just a little bit of quick fiddling with the quantization model. This was reduced to 32 colours indexed mode, same presets. This might be my favourite of the two "despite" having fewer colours. The light from the torch blends in over the wall in a more adaptive/material-aware way here. The grate needs a little love even more now (adding one of the greens from the "alternate blocks" would help it get some life back), but other than that, i think these results would pass. But I think what I'll do is incorporate that effect into the lighting layer I mentioned above, that will give me a little more control over how it looks. This is a very pragmatic approach, i think. Just be aware that the big block in my mockup of your mockup is not gradiented, which i thought worked better... the gradients are only affecting the "dirt", so to speak. So i guess you may need either another foreground layer or an effect mask property for your level background objects if you want to reproduce that. Could you do me a favor and point out exactly which tiles you think conflict artistically? It's really late here but i'll try remembering getting back to it tomorrow! The 256 and greater resolutions were honestly a mistake on my end; I had some of the guides in my gimp file placed wrong at one point. Currently everything is set to be 240 pixels tall. I'm not 100% sure where I got that number from; I thought I had set it to be the same height as a SNES game, but double-checking reveals that would have been 224. I think that might have just been how things turned out once I had the camera set up properly in Unity; most of the base code is based off of an earlier project. Honestly the simulated resolution is subject to change; I have some more tests and refining to do with the engine to make sure it looks right. 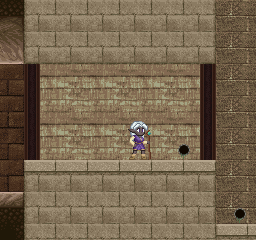 (Like right now the player will float a fraction of a pixel above the ground.) And I may need to change the resolution as part of that process. But right now my focus is on creating the actual artwork, not the actual level designs or the engine work. 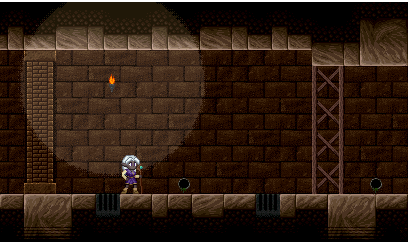 The scenes I am working on are just simple mock-ups that let me show off and test various tiles I would need to use. I have a few various standards I was trying to keep my game within; largely it is an amalgamation between different 16 bit era systems. But these decisions have really just been "starting points" because I may find that I need to make some changes once more of the game comes together. For the time being, as long as things generally look like something that could run on the SNES I'll be happy, and I'll work out the details of how I want to operate once I've got more of the game's details figured out. Ok so i promised i'd return to the thing you asked me about yesterday. In the first of your mockups, the far-off bricks are more complex than the pillars, the mud, the sewage pipe and the grate. This is fine, but the latter looks more hand drawn and the former looks a bit more "photographic", which can be hidden. But imo the difference is passable. It's just more usual for "foregound" objects to have a little higher detail and/or colour count than the far background, but it doesn't have to be that way always. In the second of your mockups, everything except the 2 vertical frames and the sewage pipe look a bit like photography-derived textures i'd expect of a relatively early textured 3d game or a 90 webpage wallpaper. I'd try to retrace them manually to bring some order/reduce graininess, vary the colours a bit so they're more spread out hue wise, and come up with a ruleset for myself for the brightness and hotness/coldness of the solids/nonsolids. I've made some updates. I've got a simple lighting layer set up, and I've reworked the tiles for the second area. I've still got some changes I want to work on, but I want to get some feedback on what I've got right now. So I decided to properly count all the colors and palettes being used, and compared to what the SNES can handle in mode 1 I actually have plenty of room for more. 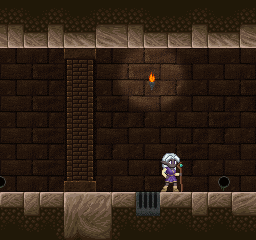 Previously I was thinking that the drain pipe and torch would have to be sprites to help divide the load. (I think I might have been making that decision back when I thought these two versions would be in the same "room" and thus need to have both be viewable at the same time.) 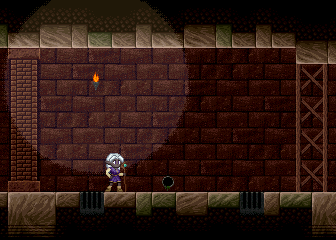 With that in mind I think I may go back and add highlights around the torch as part of the normal background tiles. But for the moment I think I'm going to move on from this area and work on a different scene. I'll take a look at it with a fresher mind in a few months. Until then, here's the last update I've been working on. I cleaned up a couple pixels in the bricks that looked too distinct, and tried to get that second area to look less flat. Let me know what you think, or if there are any other changes I ought to make. I'll review all the comments when I come back to it in a few months.